The Roundtable. : Mini Movie Reviews: "Surveillance" and "Choke"
I like to feel tense and ill-at-ease at the movies. It's fun to be in the movie theater and feel dread - you know the lights are going to come on. Jennifer Lynch's "Surveillance" certainly was creepy -- up until the end, which was mundane. I guess the question I would like to ask a director like Jennifer Lynch - who has adopted many of her father David's visual tics but little of his sense of the mystical or sublime -- is what it is exactly she wants us to feel when we leave a movie like "Surveillance"? In the end it is hardly anything more than a slasher film. It wants to be a little bit like "The Twilight Zone" -- but without Rod Serling's sense of wonder. Because "Surveillance" doesn't end with a continuation of the unknown, or surrealism, is simply drills down to a couple of serial killers bellowing wildly. You know the type, two crazy outlaws so much in love they need to kill people. It's been done at least since "Bonnie and Clyde." So what is the point, exactly? "Bonnie and Clyde" was as much about movie style as it was about rebellion - the zeitgeist of the late 1960s. Terrence Malick's "Badlands" was about loneliness and alienation. Oliver Stone's "Natural Born Killers" was about thick moral decay, as much as I dislike that movie. "Surveillance" is about technique. Pretty good technique, no doubt, but again -- after being creeped out, which is fine, what am I supposed to do with all the carnage Jennifer Lynch has left behind? Directed and written by Clark Gregg, from a book by Chuck Palahniuk. 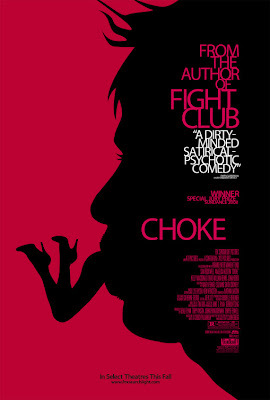 Maintaining a consistent tone is one of the most difficult things to achieve in the movies, and "Choke" aced that test. It is the sweetest movie ever made about some of the most dysfunctional folks you're ever going to meet. Everyone in the movie is an unholy mess. They cheat, they lie, they have addictions, they're needy, they can't hold a job - the list continues. But with an expert cast of actors, Sam Rockwell, Anjelica Huston, Joel Grey (! ), Viola Harris, and so many more, and with a great script, the film is a continued surprise because it doesn't annoy you, it delights you.